Johannes, who was born about 380 AD, and rose through the ranks of the civil service until he was eventually appointed a principal secretary to the Western Emperor Honorius. The latter died childless on August 25th, 423 AD whereupon Johannes seized the vacant throne and sent an embassy to Theodosius II in Constantinople requesting official recognition. This was not forthcoming, as the Eastern Emperor had his own candidate for the throne – Placidius Valentinianus (III), his cousin, and a nephew Honorius by his sister, Galla Placidia. Theodosius sent an army to Italy to champion the cause of the four-year-old Valentinian III, and Johannes was captured and executed after a usurpation of approximately two years. 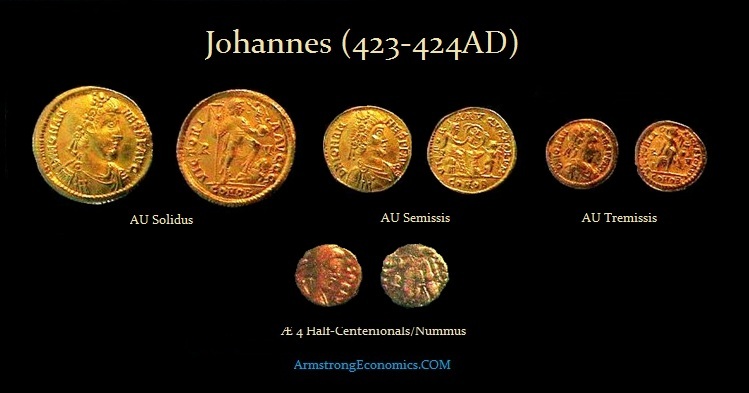 The coinage of Johannes was mostly issued from his residence at Ravenna (near Milan). Although in the Eastern Empire a facing military bust had now become normal for the gold solidii, in the West the traditional diademed profile effigy was still retained.